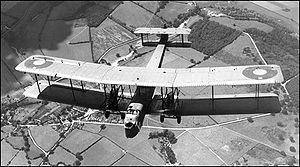 The Vickers Virginia was a biplane heavy bomber of the British Royal Air Force, developed from the Vimy. The work on the Virginia was started in 1920 as a replacement for the Vimy, with two prototpyes being ordered on 13 January 1921, with a further two prototypes ordered in September 1922. The Virginia was similar to the Vimy, but notably had a lowered front gunner's pulpit to allow the pilot a greater field of view, 20 ft (6 m) greater wingspan, and a 9 ft (3 m) longer fuselage. The Virginia was powered by twin Napier Lion engines. The Virginia flew for the first time on 24 November 1922. At the Aircraft Experimental Establishment at Martlesham, the Virginia prototype underwent type trials. One of the first modifications was to replace the original two-bladed propellers with a four-bladed example. An unusual set of "fighting top" turrets were added to the top wings but were later deleted from production aircraft. The Marks I-VI had straight wings, whereas the Mark VII introduced swept outer wings. Starting with the Mark III the Virginia mounted a rear fuselage gunner, who was moved into a tail turret in the Mark VII. The Mark X was introduced in late 1924 and featured a duralumin and steel structure covered in fabric, aluminum, and wood. A total of 124 Virginias were built, of which 50 were Mark X variants. The first squadron of Mark I Virginias was assembled in 1924. Despite mediocre performance the aircraft served frontline units until 1938, when it was replaced by the newer Wellingtons, Hampdens and Whitleys. Newer designs such as the Fairey Hendon and Handley Page Heyford supplemented rather than replaced the Virginia. The final almost all-metal Virginia Mark X was the most numerous RAF bomber until the ascendance of the Heyford in 1934. After its technical obsolescence as a bomber it was used for photography and for parachute training, with jump platforms installed behind the engine nacelles. On 26 June 1940, a committee discussing the need for airborne cannon for use against invasion tanks included the suggestion of equipping Virginias with the equally antiquated 37 mm (1.46 in) Coventry Ordnance Works gun. This was not acted on. In the 1930s, the Virginias were used in some of the first tests of midair refuelling, although they were never used in this role outside of tests. The Virginia was developed in parallel with the Vickers Victoria freighter, and the two aircraft had much in common, notably sharing the same design of wing. The Virginias were highly accident prone, with 81 lost in this manner. Despite their obsolete status, Virginias continued to soldier on in support roles with the Parachute Test Flight at Henlow until December 1941. Initial prototype for the RAF, powered by two 450 hp (340 kW) Napier Lion piston engines. One prototype only. The first type 57 Virginia prototype was re-engined with two 650 hp (490 kW) Rolls-Royce Condor piston engines. One prototype only. The Type 96 Virginia prototype was fitted with a lengthened fuselage, new forward fuselage and gun positions. One prototype only. The Type 115 Virginia was converted into the Virginia VII prototpye. One prototype only. Second Virginia prototype, powered by two Napier lion piston engines, fitted with lengthened nose. One built. 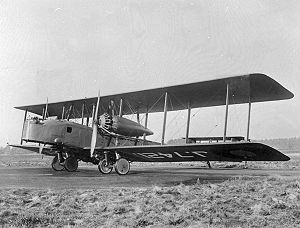 Twin-engined heavy night bomber biplane for the RAF, powered by two 468 hp (349 kW) Napier Lion II piston engines, equipped with dual-controls. Six built. Twin-engined heavy night-bomber biplane. Similar to the Virginia Mk II, but with additional equipment. Twin-engined heavy night-bomber biplane, equipped with a third (central) rudder in the tail unit. 22 built. Twin-engined heavy night-bomber biplane. This version introducted revisiions in wing folding and rigging. 25 built. Twin-engined heavy night-bomber biplane. This version had a redesigned nose, lengthened rear fuselage and sweepback wings. 11 built and 38 conversions. Twin-engined heavy night-bomber biplane. This version introduced automatic slats, wheel breaks and a tail gunner's position. Eight built and 27 conversions. Twin-engined heavy night-bomber biplane. this version incorporated an all-metal structure. 50 built and 53 conversions. Andrews, C.F. and E.B. Morgan. Vickers Aircraft since 1908. London: Putnam, 1989. ISBN 0-85177-851-1. Jarrett, Philip. "By Day and by Night:Vickers Virginia". Aeroplane Monthly, May 1993, Vol 21 No 5, Issue No 241. ISSN 0143-7240. pp. 24-29, 45. Mason, Francis K. The British Bomber since 1914. London: Putnam, 1994. ISBN 0 85177 861 5. Morgan, Eric. "Big Bombers from Brooklands: The RAF's Virginia Family." Air Enthusiast, Thirty-one, July-November 1986, pp. 34-42, 7179. Bromley, UK: Fine Scroll. ISSN 0143-5450. Sturivant, Ray. "Vickers Virginia X J6856." Aviation News, Vol. 13, No. 22, 22 March-4 April 1985. Thetford, Owen. "By Day and by Night: Ginnies in Service", Part 1. Aeroplane Monthly, June 1993, Vol. 21, No. 6, Issue No. 242, pp. 32-39. ISSN 0143-7240. Thetford, Owen. "By Day and by Night: Ginnies in Service", Part 2. Aeroplane Monthly, July 1993, Vol. 22, No. 1, Issue No. 243, pp. 18-23.. ISSN 0143-7240.